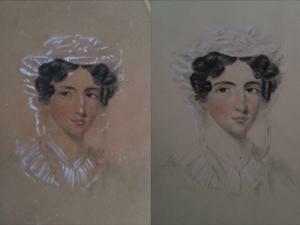 Oil paintings from the 18th Century to modern day can be cleaned, repaired and retouched with a sympathetic eye. Yellowed and darkened varnish can be safely removed to reveal the true beauty of the painting and varnished with a non-yellowing conservation varnish. Tears and rips can be patched in a reversible technique, using small areas of canvas that are of the same period as the original. The area is filled to bring the repair to the same depth as the painting before retouching. The paints are then tested and examined to conclude the original pigments and manufacture. Using pigments from the period the paints are reproduced and then used for any retouching. Flaking paint due to cracking can be lifted and re-adhered using conservation adhesive and missing areas can be treated as in repairs. All materials used are museum quality materials with an emphasis on conservation and reversibility. Paintings are always treated sympathetically, the age of each piece is always considered and restoration and conservation undertaken to preserve the original materials therefore preserving the provenance and history. Swept gilded frames can be also restored to compliment the painting. Dis-coloured and browned watercolours, prints and maps can be de-acidified and cleaned to bring the paper to its natural colour and bringing definition back to the artwork. Foxing, which appears as brown spotting can be treated and removed, usually working from the reverse of the paper ensuring that the pigments of the art are not disturbed or touched. Tears in the paper can be repaired using high quality conservation adhesive and japanese repair tissue and tidied by using the original paper fibres to merge the split. Holes can be filled using paper of similar age and manufacture to the original using the same method for repairs and tears. Folded and creased paper can be stretched and flattened safely, making it easier to mount and frame. All work is undertaken using museum quality materials with conservation of the piece at the forefront of all procedures. Original frames are often very important to the provenance and value of the painting it surrounds. Dealers and collectors are keen to have artwork in its original condition as it can indicate the age and authenticity of the picture. Unfortunately most late 18th Century and 19th Century swept frames are made from pine or oak with gesso embellishments that is then gilded all over. Gesso is prone to chipping, breaking and disintegrates in water. The gilding is often diminished by dampness or over rubbing and often gilded frames are repainted with a gold coloured varnish. Embracing modern conservation techniques it is possible to replace missing decorations and mouldings. Using a complete corner a moulding can be taken and missing corners replicated. Small areas of decoration can also be replicated using this method or by hand using a non shrink water based material. This hardens to the same consistency of the original and often can only be seen by the trained eye. 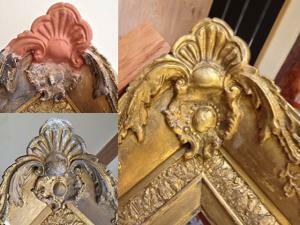 Although re-gilding is offered it can often appear too bright and may look too new for the painting it is surrounding. It is our ethos to conserve frames and therefore try to keep as much of the original that remains. Retouching is done with a sympathetic eye, tidying up and giving the frame its depth in the gold finish, but retaining its age. All quotes are free and often equate to the price of reframing the piece in a modern frame. The quality and structure of the frame is evaluated and can be consolidated to give the frame strength to last another 100 plus years.